In this series of blog posts, Vili Lehdonvirta writes about his thoughts and experiences at ISA 2014 in Yokohama, Japan. In this first part, he discusses labour market flexibilization and its implications to the study of online work. 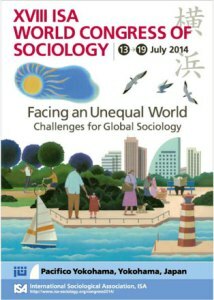 Last week, I attended the XVIII ISA World Congress of Sociology in Yokohama, Japan. It is the flagship event of the International Sociological Association, organized every four years. This year’s theme was inequality, a highly topical subject that was reflected throughout the conference. Thanks to the location, another emergent theme was East Asian societies, likewise highly topical in the social sciences today. ISA is of course a massive conference, with over 5,000 participants this year, and dozens of parallel sessions extending from morning to night over six full days. One can have a completely different experience depending on what kind of a path one picks through the programme. I previously attended ISA in Gothenburg in 2010. That time I had just recently finished my doctorate in economic sociology with a thesis on virtual consumption, so I went for sessions dealing with the sociology of consumption on one hand, and ICTs on the other. Neither of these topics were particularly big in international sociology, especially four years ago. Perhaps because of this, my experience was that the papers were very varied in quality, and not always terribly helpful to my work. This time, my experience was very different. My research has expanded from the study of digital leisure markets to the study of digital labour markets, so I went mainly for sessions dealing with the sociology of work, professions, and labour movements. I was not disappointed, on the contrary. In this series of three posts, I will present a selective summary of what I thought and learned during the conference, followed by what implications I drew from it all to the study of online work and online labour markets. Please note that my comments on the sessions and presentations are based on my own recollections and notes, and what I choose to highlight about each presentation might not be what the author considered the main point. I will provide links to session outlines and abstracts, but to obtain the actual presentations and papers, you will need to contact the authors. If any author has put their paper online, I would be grateful if you could provide a link in the comment section below. An overall frame within which much of the debate on labour issues today can be situated is labour market flexibilization: the shift from secure, full-time, long-term employment relationships towards various forms of nonstandard, entrepreneurial, and precarious work. This shift is usually seen as being having started in industrialized countries during the past few decades, and many sessions offered evidence of its advance. But at the same time, Sophia Seung-Yoon Lee and Seung-Ho Baek showed that when measured in a certain way, precariousness in South Korea had actually decreased from 2002 to 2012, although at the same time, it had become much more associated with women than men. These findings remind us that labour market flexibilization is by no means a uniform process over time, space, and social structures. Causes behind labour market flexibilization are sought in at least three different directions: employers, workers, and policy makers. Byoung-Hoon Lee and Jik-Soo Kim, like many others, trace flexibilization back to employers’ changing management practices in an era of global competition and financial market capitalism. A smaller number of presenters, such as Christian Schnell, traced some forms and sectors of flexibilization to workers’ own preferences. It is to be expected that in an increasingly diverse and pluralistic society, life courses and choices are increasingly individual, with the consequence that standard 9-to-5 working arrangements will not suit everyone. In an excellent session on precarious work and employment risks in East Asia, Jun Imai offered a fascinating example of how labour market flexibilization can be unleashed by policy makers under the banner of labour market reform. Japan’s post-war labour and social policy was based on the idea of male breadwinners in lifelong employment providing for the entire family, with a savings plan for retirement. In the early 2000s, the Koizumi goverment wanted to increase opportunities for women and young people to complement the workforce and earn supplementary income to the family budget. To achieve this, the government legalized temporary labour contracts with little or no benefits or protections, known as “haken shain”. Today, around a third of the entire workforce consists of haken shain. But instead of being the family members of a primary breadwinner, these haken shain are increasingly the breadwinners themselves. This leaves increasing numbers of families with little in the way of social protections or retirement plans, with dire social consequences during the recent economic crisis. A similar policy maker oriented account was provided by Peter Saunders and Melissa Wong from Austrialia. Another theme related to labour market flexibilization is labour market segmentation and the notion of dual labour markets. Flexibilization doesn’t influence all jobs. It is as if there were two different labour markets: the primary market for regular workers and the secondary market for nonstandard workers. In the same session with Jun Imai, Jyh-Jer Roger Ko talked about the relationship between the two labour markets. According to the “bridge” hypothesis, nonstandard workers are likely to eventually obtain a regular job by first gaining experience and a foothold in the organization through probationary contracts. According to the “entrapment” hypothesis, there is no mobility from the secondary to the primary market: once a worker is branded as secondary, they are trapped in a neverending string of precarious contracts. Ko’s analysis of empirical data from Taiwan indicated that in this context, the entrapment hypothesis was on average more accurate. What is driving the growth of online labour markets – firms’ changing human resource strategies, workers’ own preferences, and/or policy makers’ choices? How does online work interact with different countries’ social structures and policy regimes, enabling new opportunities for people and/or exposing people to new risks? Does temporary online work act as a bridge to more gainful employment, or does it trap people to a second-class existence? Or more likely, to whom does online work act as a bridge, and to whom as a trap? In the second part of my ISA 2014 report, I will look at labour market flexibilization in the context of professionals and knowledge workers, drawing more implications to the study of online work. Note: This post was originally published on the OII's Connectivity, Inclusion, Inequality blog on 25 July 2014 1:20 pm . It might have been updated since then in its original location. The post gives the views of the author(s), and not necessarily the position of the Oxford Internet Institute.